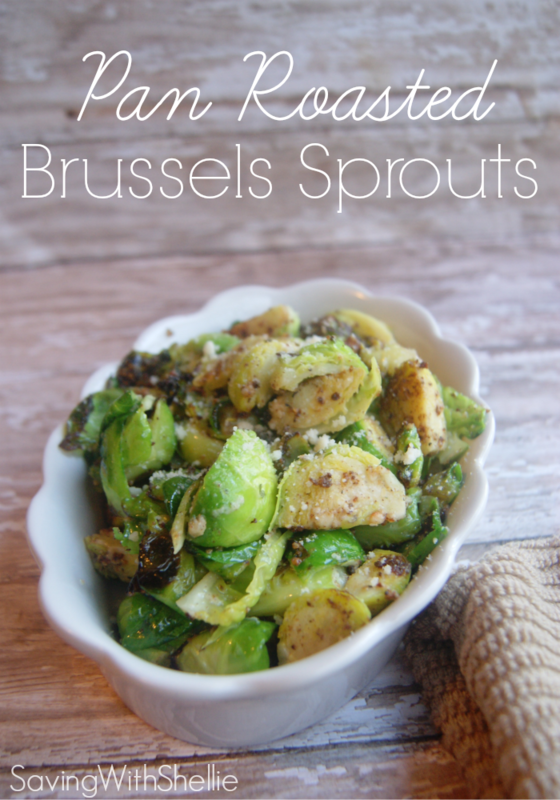 If you love Brussels Sprouts already or you are trying to coax the family into trying them this is a great recipe for the whole family. These are incredibly simple to prepare yet make an elegant presentation on your dinner table. Roasting the Brussels sprouts in a pan until they are caramelized gives so much delicious flavor by bringing out their natural sweetness -even the kiddos gobble up the little pieces of this tasty green vegetable. I think they smell heavenly! I may or may not be guilty of popping them in like popcorn before plating them! They pair well with steak, pork, or chicken dishes. Trim the end off each Brussels Sprout. Remove outer 2 layers of each sprout and discard. In a large saucepan over medium-high heat combine; Butter, Brussels Sprouts, Garlic Salt, and Pepper. Saute until they begin to turn a dark golden brown-roughly 8-10 minutes. Personally, I like mine a little on the darker side so I cook mine more like 12 minutes. Remove pan from heat and sprinkle Parmesan cheese over sprouts, toss a few times to coat well. If you’re looking for more great recipes for Side Dishes be sure to Follow me on Pinterest and check out the Apps & Sides board! I’ve always pan roasted/sauteed brussels this way but without the cheese. Lately, I’ve been replacing some of the butter with olive oil, and it still tastes awesome. If you use frozen brussels, just add a little bit of water to the pan, along with the oil, cover and steam about 10 minutes, then remove the lid to allow the extra water to finish evaporating. Finish sauteing until browned. Yumm! I tried the recipe for the first time last night using frozen brussels sprouts. Wish I had read your comment before I tried the recipe. However, they were really good. I am going to cook more tonight using your tip for cooking frozen brussels sprouts.. Thank You! The ingredients list calls for garlic salt AND salt, but in the directions the regular salt is not mentioned. I just want to confirm that regular salt is one of the ingredients before I make this. IT SOUNDS DELICIOUS!!! The salt is to taste. So after you make them if you think it needs it, add in a little salt. I wondered about the double salt. And it was definitely too salty. But I will be making this again for sure! It was delicious even though it was salty!!!! I used garlic powder and salt to taste. I do not like brussel sprouts. I have tried them prepared a number of ways, but these are amazing! I couldn’t stop eating them! I have made these quite a few times and they are my go to recipe for brussel sprouts even over roasting. The recipe is perfect. Thanks.